A phlebotomy technician is a skilled, knowledgeable professional who works with the public on a day-to-day basis performing venipuncture procedures. Although knowledge of phlebotomy is required in order to practice venipuncture, it is one part of the equation that helps to make a good phlebotomist. In addition to having a strong grasp concerning phlebotomy, a good phlebotomist is someone who also possess good traits. A knowledgeable phlebotomist with good traits is a phlebotomist of great value. 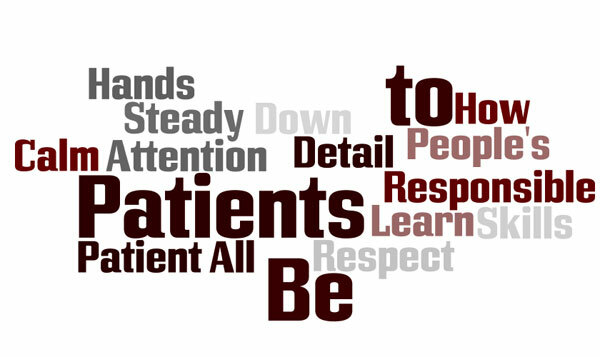 One trait that a phlebotomy technician should possess is the ability to provide respect to all patients. As a professional who works with a diverse population on a day-to-day basis, respect is required by all phlebotomy technicians. Respect is easily shown to patients when phlebotomists introduce themselves prior to the performance of any phlebotomy procedure. Respect is also shown when patients are greeted by their full name or asked permission to be addressed by first name only. When patients are provided step-by-step instructions during the performance of a phlebotomy procedure, this is also a form of respect. As such, patients are treated as individuals with real concerns and emotions. As reverence should be shown to all life, it is the responsibility of the phlebotomy technician to treat each patient with respect regardless of age, ethnicity or economic status. One of the greatest qualities that any phlebotomist could possess is a high level of patience. As a phlebotomist who works with countless patients from various cultural backgrounds and individuals of various age groups, patience is a necessity. As such, this quality may be required in situations where a phlebotomist is unable to understand a patient’s verbal request due to a language barrier. As a language barrier can range from a difference in dialect to the use of a different language, patience is required in order to obtain effective communication. In such an instance, it may be necessary for the phlebotomy technician to take time and listen carefully to information being stated or request the assistance of an interpreter. As patience is a virtue, it is a trait that is extremely useful during venipuncture procedures required for infants, young children and the elderly. In a situation where a child may be disagreeable or makes it impossible to collect blood, an anxious parent would welcome a phlebotomist with such a characteristic. Although a patient phlebotomist may work well with all populations, an individual with such a trait will shine among populations concerning the young and the elderly. As many young individuals may require special attention from a phlebotomist due to their fear of needles, individuals among the elderly population may also require special attention due to the various skin changes an elderly individual will experience. Skin changes in an elderly patient may present a slight challenge for a phlebotomist, as the mature skin loses elasticity resulting in the risk of rolling veins. The ability to calm anxious patients and put them at ease is a desirable quality among healthcare professionals. When working with patients, it is extremely important for phlebotomists to calm the fears of their patients while allowing them to gain confidence in the phlebotomist as a person and as a professional. When a patient gains confidence in a phlebotomist, blood collection procedures become extremely easy and pleasant for all involved. As phlebotomists are given one of the first steps in determining the health condition of patients, it is imperative to have phlebotomists who are responsible individuals. The diagnostic testing and the early treatment of any health condition begins with the correct steps taken by a phlebotomist. Such steps include correct patient identification, correct venipuncture procedures and labeling of evacuated tubes. A mistake in any phlebotomy process could lead to contaminated blood specimens or a patient being misdiagnosed with a medical condition that may not exist. The responsibility of obtaining accurate blood results begin with a responsible phlebotomist. 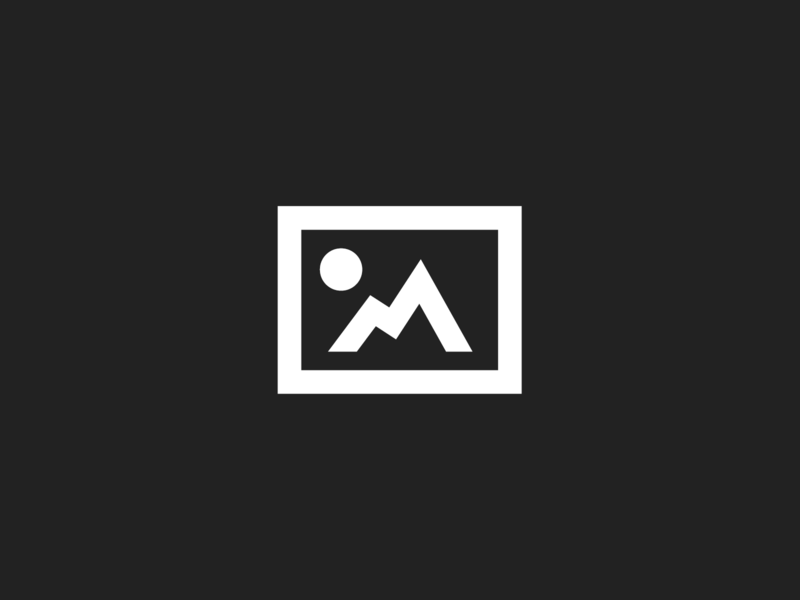 A phlebotomy technician with steady hands is a phlebotomy technician who is valued by patients. Such a phlebotomist is valued due to his or her ability to control hand movements during venipuncture procedures. This is important during the blood collection process, as it allows the vein of interest to be punctured correctly the first time. A Phlebotomist who does not have steady hands risk the insertion of a butterfly needle in a vein other than the median cubital vein. This vein is commonly used to obtain venous blood during a venipucture procedure. Additionally, unsteady hands may cause an artery to be punctured or increase the risk of damaging neighboring nerves. When working with the public, people skills are also very important. Although a phlebotomist may occasionally encounter a disgruntled patient, he or she is still expected to exhibit people skills. Regardless of a patient’s mannerism, the professional phlebotomist should still address such patient appropriately by thoroughly answering questions and providing him or her with information necessary to complete any phlebotomy procedure. Additionally, people skills are exhibited when the correct choice of words are used with a calm tone of voice. Attention to detail is a very important trait for all phlebotomists. Such a trait is important because it can assist in avoiding unnecessary mistakes. In an instance where two patients may have the same name, it is imperative to identify each patient correctly in order to provide the appropriate phlebotomy care. Therefore, attention to detail is required when obtaining information from both patients. Information may include the correct spelling of their names in addition to their ages, addresses and telephone numbers. Paying attention to detail should assist any phlebotomist in identifying each patient correctly. As skilled phlebotomy technicians are needed in the healthcare industry, a phlebotomist with skills and good traits are of good value. 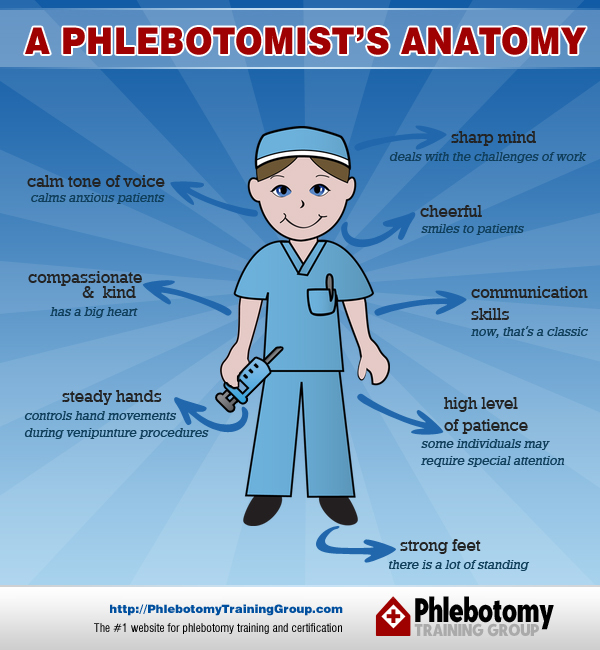 A phlebotomist with skills and good traits can perform his or her job efficiently and relate well to many patients. Great skills and good traits are of great value to the healthcare profession and to patients. As such, these traits will reflect the positive side of healthcare and lend itself to a positive phlebotomy experience for the patient.